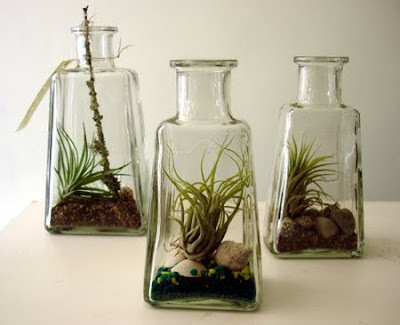 Thanks to Kristine for this calliente tip about repurposed tequila bottles housing tillandsia terrariums at fernseed.com! While my history with vodka is tentative at best I live for good tequila... and I can't imagine a better use for an empty bottle than these great terrariums by the imitable Kate Bailey! I love the thick glass and the tillandsia is a perfect shape for the bottle. Ole! Too cool!! you sure can find them! What a great idea. I love the shape of the bottles. Looks great, but I'm not sure if it's ok for the plant. I put my tillandsia in a glass container too, but now I'm worried since I read that they need good airflow. I wonder if it really is a big deal, or if they'll be just fine in glass..
How do you give its water requirements when I read that spraying may not be enough at times? I wonder how long it can survive in a bottle with restricted air flow? Tillandsia do enjoy a nice dip in water once in a while. I am not sure if that would be possible while keeping them in bottles.